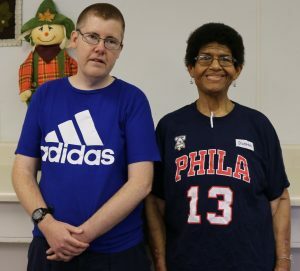 Tracy Roberts and Chris Bauer are making a difference in their community while at the same time overcoming the difficulties of living with Prader-Willi Syndrome (PWS). PWS is known as a complex genetic disorder most noted for a chronic feeling of hunger that can lead to excessive eating and obesity, according to the national Prader-Willi Syndrome Association. In some cases, a PWS-like disorder can happen if the hypothalamus portion of the brain becomes damaged through injury or surgery. National statistics indicate that one in 12,000 are diagnosed with PWS. Although considered a rare disorder, PWS is one of the most common conditions seen in genetic clinics and most common genetic cause of obesity. Two group homes in Stanly County are dedicated to serving the needs of those with PWS: Circle Drive and Lafayette. Circle Drive opened in 1995 and was the first PWS group home in North Carolina. A Housing and Urban Development (HUD) grant received in 2000 helped Monarch open the second home. Group homes provide the necessary structure and supervision for adults with PWS, helping them avoid compulsive eating and severe obesity. Roberts and Bauer, who both reside at the Circle Drive residence and attend Stanly Industrial Services (SIS) day program in Albemarle, use their skills to help within their community. Some, even family members, were skeptical that PWS would prevent them from successfully volunteering with a food-related agency. The pair is proving those skeptics wrong. Roberts and Bauer volunteer together at the Alcoholics Anonymous meeting location in Stanly County every Thursday helping with cleaning duties. Bauer, 38, takes his PWS in stride and enjoys his volunteering at AA as well as the Stanly Community Christian Ministry food pantry where he stocks shelves, a role he has maintained for the past two years. His other tasks include putting out the bread and desserts for the families who benefit from the agency’s services. Bauer has made friendships through his volunteering and looks forward to his shifts three times a week. During busy times, Bauer says he enjoys assisting with notifying families waiting in the lobby. Roberts, 51, volunteers with Meals on Wheels and says the best part is seeing and talking with the senior citizens. “They are so sweet. Some of them don’t have anyone to talk to,” she says of her Meals on Wheels recipients. Besides artwork and singing in the SIS Singing in Style choir, Roberts also works volunteer shifts answering the phone at OASIS of Stanly County, an agency providing an array of services for the county’s senior citizens. “We are proud of how important it is to each of them to be a valued part of their community and make a difference by helping others. In whatever way our team can assist the people we support reach their personal goals as well as make new goals, we work together to accomplish them,” Hamilton notes.